Documents released in the High Court this week reveal for the first time some of the behind-the-scenes debates in Whitehall over whether the UK should work with the US on Guantanamo Bay - and how the decision was taken to allow British citizens to be taken to the camp. Somewhere in London, there is a secure room where some 80 lawyers and officials are reading through 500,000 documents - and deciding which will see the light of day. WHO IS SUING THE GOVERNMENT? The work, with no clear end in sight, is part of what is fast becoming one of the largest actions in English legal history: an attempt by former Guantanamo Bay detainees to sue the British government. The men say MI5, MI6 and three government departments could have prevented their detention and mistreatment. The former Labour government rejected the allegations and promised to defend itself in the courts - but Prime Minister David Cameron is trying to get the six men to enter settlement talks to run alongside a judge-led inquiry into allegations of complicity in torture. On Wednesday, the High Court rejected a government plea to suspend the men's legal action for three months in the interests of a potential settlement. And on Thursday the government agreed to a demand by Mr Justice Silber to disclose more documents relating to the alleged mistreatment of British terror suspects in the months following the 9/11 attacks. To be released by 3 September, they will include material from departments including Downing Street and the Home Office, as well as the police, Crown Prosecution Service, and MI5 and MI6. The judge said he particularly wanted to see any emails relating to the men who are suing the government, and "any information showing actual knowledge on the part of any of the defendants of a serious risk of incommunicado or arbitrary detention, rendition, ill-treatment or torture of terrorist suspects by or at the behest of the United States authorities". The detainees' decision to fight on came as the High Court released the first documents covering what was going through the minds of British officials during Guantanamo Bay's opening in 2002 - and what happened next. The hundreds of pages of documents are heavily redacted with a censor's black pen. But what we can see indicates tensions in Whitehall, developments in the rules of engagement for intelligence officers overseas and the role of former Prime Minister Tony Blair's Downing Street. One series of documents suggests a row took place between Number 10 and Foreign Office consular staff over the future of one detainee, Martin Mubanga. His lawyers say he could have been brought back to the UK but the government denies wrongdoing. Guantanamo Bay received its first 20 al-Qaeda suspects on 11 January 2002. In London, officials were locked in debate over what to do with about a dozen men, who were thought to be British, being held by the US in Afghanistan. Each was suspected of being a dangerous extremist - and the UK did not want them back. A partially censored Foreign Office document dated 10 January 2002 reveals the developing thinking. At this time, there were no public pictures of the detention camp - and no indication of what conditions would be like. "Transfer of UK nationals held by US forces in Afghanistan to the US base in Guantanamo is the best way to meet our counter-terrorism objectives by ensuring that they are securely held," it reads. "Our line [for the media] - that we are seeking information and reassurances and that the US is aware of our opposition to the death penalty - is not strong, but a stronger line is difficult until policy is clearer." A telegram in the name of Foreign Secretary Jack Straw was sent to diplomats including Sir Christopher Meyer, the ambassador to Washington. It approved allowing the US to take British detainees to the US naval base - providing MI5 had finished interviewing the men in Afghanistan. "No objection to American plans to transfer UK detainees… we hope that UK national will not be included in the first group of transfers," it said. "We should also insist on consular access and full information on future handling. The UK approach on the repatriation and prosecution of UK nationals is still being considered." Within weeks, British nationals were arriving in Guantanamo Bay but there had still been no decision on repatriation. We are faced with the return of a British citizen to the UK about whom we have serious concerns, whom it may be difficult to prosecute and whose release could trigger a hostile US reaction. Washington wanted to know what would happen to the suspects if handed back to the UK. But officials in London knew the men could not be prosecuted unless there was evidence against them. Home Secretary David Blunkett was reported to be concerned about prosecuting suspects who could turn out to be "young and ill-informed individuals" who may have been manipulated into travelling to Afghanistan. A minute from a 26 February 2002 inter-departmental meeting reveals the anxieties. "The meeting agreed that UK should not be in any hurry to take back the detainees though the FCO was quiet on that point," it says. "If the difficulties we face steers the Americans to make more use of military tribunals, FCO will have some obvious problems of public presentation… but these are likely to be preferable to those associated with the detainees being released in the UK." 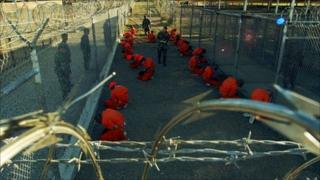 Nine British citizens ended up at Guantanamo Bay, alongside five other men who had been UK residents. But the first formal request for the release of any of them was not made until 8 January 2004, the papers say. Policy and guidance was also shifting behind the scenes. The detainees involved in the legal action claim the security and intelligence services knew they faced mistreatment or torture but did nothing to stop it. This second prong of the action is also denied by the government and it will be the focal point of the judge-led inquiry launched by Prime Minister David Cameron last week. In early 2002, officers from the agencies told London that some prisoners were being mistreated. They asked for legal advice. They were told: "Given that they are not within our custody or control, the law does not require you to intervene to prevent this." But the guidance developed in the years that followed. One MI6 document, released to the courts this week, called Detainees and Detention Operations, demonstrates how complicated the rules became as lawyers explained the responsibilities that officers faced. The document, dated April 2005, covers in minute detail what officers should consider before joining a detention operation run by a foreign power - the kind of situation that officers may have found themselves facing if working alongside the CIA in Afghanistan. Most of the warnings are nuanced, reflecting the difficult work of intelligence and the need to gather life-saving information. Other questions officers are told to ask themselves are stark: "Is it clear that detention, rather than killing, is the objective of the operation?" reads one paragraph. It tells officers that "ministers may need to be consulted" if there is a real possibility that a suspect will be tortured. Later, MI6 produced a simplified flowchart, also released to the courts, telling officers how to uphold the law. The document looks at what officers should do if a foreign power ignores pleas from London to treat a detainee humanely. The guidance to the field officers, in that situation, remains redacted.